Sunday was a genuinely tough afternoon for Galway hurling supporters in a crowd of more than 7,000 at Pearse Stadium as they watched their team blow a good lead twice before going down to Wexford by 1-21 to 3-13. It was a significant defeat for Galway and more than likely this loss has scuttled their league promotion aspirations for 2017. With Wexford having already beaten other promotion hopefuls Limerick in the first round, all they have to do now is beat the three weaker teams in the division, Kerry, Offaly and Laois, and they will be in division 1A next season. This was a game Galway could have won. However, when they were in the ascendancy at different times in both halves, they lacked a ruthless streak to push on and keep Davy Fitzgerald's team down. Micheál Donoghue's side led by seven points, 2-07 to 0-6, at one stage in the first half after two good goals from Joseph Cooney and Johnny Coen, and they looked to be cruising going into the last 10 minutes of that half. However Wexford rallied strongly and notched 0-5 on the trot to leave the score 2-7 to 0-11 at the interval. It was a pity Galway could not have hit a point or two in that period to keep the scoreboard ticking over, but it was all Wexford for the final minutes before half time. After a returning Joe Canning rifled home a penalty midway through the second half, Galway led by six points, 3-12 to 0-15, but to the consternation and frustration of every Galway person at the venue, they were only able to muster one more score in the closing 17 minutes, whereas Wexford struck 1-06. Such a return is not good enough. To make matters worse, that Galway point came from a superb long-range free from goalkeeper Colm Callanan. Cork referee Cathal McAllister did Galway no favours in that period of time with some harsh decisions going against them, and few frees, if any, were awarded to the men in maroon and white. One obvious foul by a Wexford defender on Joseph Cooney practically in front of the Cork man's eyes in the last 10 minutes would have led to an easy scorable free for the home side. Such moments can change the flow of a game completely. However, it would be unrealistic to blame McAllister for this disappointing defeat. Wexford are moving well under Davy Fitzgerald and they have some momentum and belief after two good wins on the trot. To be honest, in the last few minutes Galway, for whatever reason, were unable to respond to Wexford's rally, and there only looked likely to be one winner in the final few moments. It was no real surprise when Galway coughed up two late frees and Wexford sharpshooter Conor McDonald nailed them to seal the deal for the Model men. 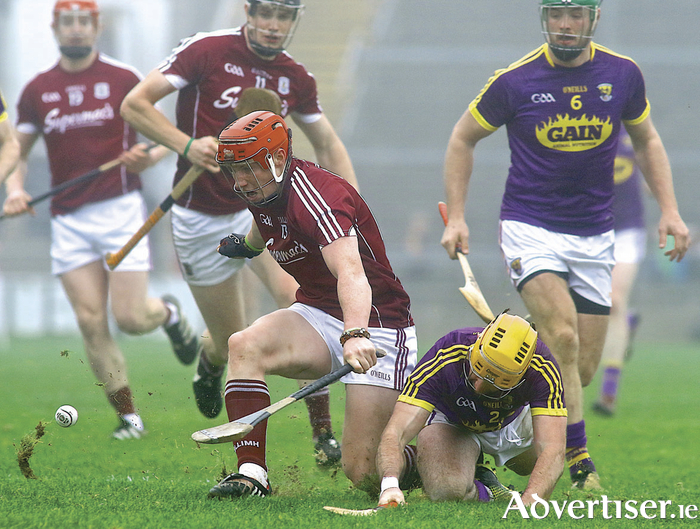 It is early days in the season, but it was a sickening result, and allied to Ahascragh/Fohenagh's defeat in the All-Ireland Intermediate final, it made for a disappointing weekend for Galway hurling. Scorers for Galway: J Flynn 0-5 (2fs, 1, 65 ), J Cooney 1-1, J Coen 1-0, J Canning 1-0 (1-0 pen ) C Cooney 0-3, D Burke, C Whelan, B Molloy, C Callanan (f ) 0-1 each. Galway: C Callanan, M Donoghue, J Hanbury, Daithí Burke, G McInerney, A Tuohy, A Harte, J Coen, David Burke; D Glennon, JCooney, C Whelan, C Cooney, J Flynn, B Molloy. Subs: J Canning for Molloy (50 mins ), R Burke for McInerney (54 mins ), N Burke for Whelan (70 mins ).